REV. DR. C. WELTON GADDY, HOST: This past week, I noticed a strident column in the conservativeWashington Timesdecrying the Federal Communication Commission’s new rules on Net Neutrality asan existential threat to religious freedom. Huh? Joining me now to shed some light on this issue is a pioneer in onlinefaith-based activism, Valarie Kaur. Valarie’s the founder of the websitegroundswell-movement.org, housed at Auburn Theological Seminary in New York City, where she serves as a Senior Fellow. Valarie, welcome again to State of Belief Radio! VALARIE KAUR, GUEST: It’s a pleasure to be back, thank you. WG: For those of us further away from the digital frontier, would you be kind enough to summarize what’s involved in the discussion on “net neutrality”? VK: Absolutely. The ﬁrst thing to understand is that the future of religious life and interfaith cooperation in America depends on a free and open Internet – which means it depends on net neutrality. 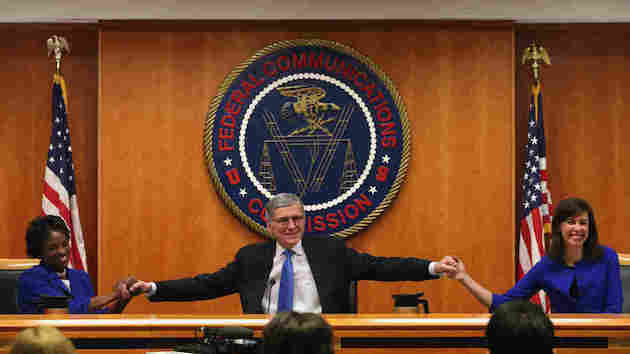 Now, net neutrality can seem like a really confusing issue – it was to me before I really learned what was at stake – but it’s really very simple: it’s the idea that the Internet should remain a place where every person, no matter the color of our skin, the content of our beliefs, or the size of our wallets should have an equal chance of reaching people online. What’s happened is that large providers like Comcast and Verizon – they have a proﬁt incentive to want to control more of what happens online; to block or slow down sites, or charge us fees in order to reach people faster. But this would essentially end equality on the Internet as we know it. So the good news is that in the last year, more than four million people of all faiths and backgrounds made their voices heard; submitted comments in to the Federal Communications Commission, the federal agency responsible for rules governing the Internet. And as a result just last month the FCC reclassiﬁed the Internet as a “public good” – as essential as water or electricity; and they adopted strong, bright-line rules to protect the Internet as we know it. So this is necessary for innovation, for economic growth, for democratic discourse in America; it’s also vital for the future of religious and spiritual interfaith life in the United States. WG: So Valarie, how does the FCC’s ruling impact faith communities, speciﬁcally, and activists in general – and are you happy with it or worried about it? VK: I am celebrating it! It’s a ﬁght that I’ve been honored to take on in the last year. One year ago, the vote for strong protections for the open Internet seemed impossible; but it was thanks to a groundswell in the last year that made this victory possible.What we have to understand when we think about faith communities is this: the Internet has become the prophetic platform of the 21st century. We’re seeing a new generation of faith leaders – progressive and conservative – connecting with their congregations; serving their communities; organizing for social change, all online. So, take traditional religious life: churches, synagogues, mosques, temples, gurdwaras, other houses of worship – they’re all relying on the Internet as part of their basic operations: hosting sermons and bulletins; raising funds; building online communities. In a time when many traditional religious communities have to innovate in order to reach new generations, a free and open Internet – the kind that the FCC has voted to protect – is essential for us to run our houses of worship eﬀectively and remain relevant in the 21st century. But as a millennial, I know that the future of interfaith cooperation in America is also at stake in this issue. The open Internet right now is a place where we can engage people who are diﬀerent from us: a Sikh or a Humanist or a Muslim – we can hear their stories; we can engage with them in ways that we can’t in the real world – at least we can take those ﬁrst steps online. And millennials are driving entirely new online platforms for interfaith engagement in bold new ways that include dialogue; service; advocacy – we can think of Interfaith Youth Core, or publications like State of Formation. And as you mentioned, working with the team at Auburn Seminary, I founded Groundswell a few years ago to do exactly this – to help give faith leaders online tools to ﬁght for social change. Groundswell has now become the largest multi-faith online organizing community in the country – and this simply would not have happened without a free and open Internet. So think: if we had to pay Comcast or Verizon special fees in order to reach people faster so that they wouldn’t encounter the spinning wheel of death when they went to our site – we wouldn’t have even gotten oﬀ the ground. So there was so much at stake for faith groups in the ﬁght for net neutrality, and yet so few faith communities really could understand the issue enough to know what was at stake. So that’s why my next step after Groundswell was joining forces with Cheryl Leanza of the United Church of Christ. It’s a project coordinated by Stanford Law School’s Center for Internet and Society and the United Church of Christ Media Justice Ministry. And our work is to amplify the voices of faith leaders on this issue. You can go to our website, faithfulinternet.org to hear voices like Rev. William Barber, on the streets of North Carolina. He said that right now, the web is a place where all Americans have an equal voice. Weneed to keep it that way, especially for our organizing of the Moral Mondays Movement and other organizing around the country.You can also hear the voice of Helen Osman of the US Conference ofCatholic Bishops, who says that Pope Francis’ inspirational message could only be shared with millions of people because of the open Internet.You can also hear the voice of Congressman John Lewis, who says that we need the Internet for this generation and for generations yet unborn, for all the movements yet to come. WG: There are voices claiming that the new rules open the door to government censorship of Internet content for the ﬁrst time. Do you see any sign of that as something to worry about? VK: These folks have it totally wrong. It’s not that the FCC is regulating the Internet; they’re regulating access to the Internet – which means that they’re ensuring that all communities have equal access to the Internet. And so it’s really, really important to understand that many folks who are claiming that the FCC decision is bad for America are folks who are listening closely to the proﬁt incentive needs of large Internet service providers. And on the other side are four million Americans, dozens of lawmakers, entrepreneurs, startups, artists, educators, innovators of all kinds who are, together, claiming that this is actually something to celebrate and to defend in the weeks and months to come. WG: Valarie, you are, among so many other things, a visionary. What are the next opportunities for using the Internet for good going to be, in your opinion? VK: When I think about my own life – as a lawyer, as a ﬁlmmaker, as a Sikh activist – I realize that my entire life’s work would not have beenpossible without the open Internet. I made my ﬁrst ﬁlm about hate crimes after 9/11. No one would have ever heard about this work if it weren’t for me blogging about it. And then every campaign since, we’ve used it to tell our stories. Most recently, as you know, Welton, inthe aftermath of the mass shooting in Oak Creek that took the lives of Sikh-Americans – it was the largest attack on a faith community since the 1963 church bombing that took four little girls – and yet the media trucks left all too soon. But we were able to keep the story alive through social media, through blogging, through posting essays and videos; we were able to organize to get the federal government to change their policy on hate crimes in the United States.I see that the future of Internet innovation really points to equipping more communities like mine – like the Sikh community; communities that are historically less visible; communities that are marginalized – in bold new ways to tell our stories, to organize for social change, to shape democratic discourse in the United States. WG: Valarie Kaur is an award-winning ﬁlmmaker, activist, and public speaker. She’s the founder of groundswell-movement.org at Auburn Theological Seminary in New York City, where she’s a Senior Fellow. She’s also, I just found out today, a new mother.I have to say to you, Valarie, I’ve missed talking with you. You are so knowledgeable on so many diﬀerent fronts and so articulate in helping us understand what we need to understand, and how to build bridges instead of causing separation. It’s always great talking with you. I’m conﬁdent that you’re going to be as good a mother as you are speaker, ﬁlmmaker, activist and so much more. Thanks for being with us again on State of Belief Radio.